Israel and Palestine are small places on the map. For example, the State of Israel is not much larger than New Jersey—the area known as Palestinian Authority is even smaller. A bus ride from Galilee to Jerusalem takes about four hours and other distances between well-known Biblical locations are even shorter. A major geographical feature of Jerusalem is the Kidron Valley, which separates the old city from the Mount of Olives. The traveler descends from the base of the Temple Mount on the east down into the valley floor and then on a switch-back road and then ascends eastward to the Mount of Olives. 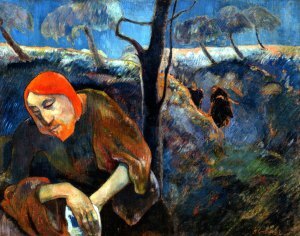 Intervening in the eastward ascent is the Garden of Gethsemane. The Garden is an olive grove with trees believed to be two-thousand years old or older. From the Garden of Gethsemane, a hardy hiker can climb to the top of the so-called Mount of Olives and within a half-hour or less be in what in Biblical terms is called the wilderness; it is, in fact, the vast eastern desert eventually leading to the Jordan Valley and then down to the Dead Sea. Think about these distances in terms of first century Judea. On foot, the distances may have been far and wide, but manageable—today they are day trips. The gospel accounts tell us that Jesus walked these distances several times. Therefore, walking to the top of the Mount of Olives from the Garden of Gethsemane into the wilderness would not have been a difficult task for Jesus. Nonetheless, it was a difficult choice. Jesus, aware of Isaiah’s words, “The Lord GOD has given me the tongue of a teacher, that I may know how to sustain the weary with a word. Morning by morning he wakens—wakens my ear to listen as those who are taught. The Lord GOD has opened my ear, and I was not rebellious, I did not turn backward.” The prophet’s words were Jesus’ to fulfill. Nevertheless, as a man facing an immediate terror in Jerusalem, he had the option of rising from his sweaty and bloody prayer in the Garden and walk away–walk up the hill into the wilderness. No one would chase after him—most people of that time did not go into the wilderness unless it was necessary. His followers would have dispersed and disappeared into the Passover crowds filling the city streets. Jesus of Nazareth would be just another of the many claiming Messiahship in first century Judea and even afterward into our time and would mostly unknown to history. Every year Christians who follow a liturgical calendar encapsulate through the Gospel accounts three years of Jesus’ ministry into one. But, let’s be his disciples in the first century and not know the outcome. We are not sure about Jesus’ birth—we have been told the stories. However, we may know his mother Mary, she is the epitome of selfless devotion. We have heard stories about Joseph who cared for Jesus and protected him in his infancy. There is a story about mysterious Magi coming from the east, but we are not certain what to make of that. We followed Jesus to the Jordan and witnessed his baptism, likely we were with him the time he changed water into wine, and we have been amazed by his healing ministry. We found he treats everyone with respect and invites the world to know God as the Father. We have come to know through Jesus that the kingdom of God is near us right now, not in some distant place in the sky. We have come to know Jesus and to love him and what he teaches. We expected more. Before the Passover Sabbath he is dead—dead! If this man, a great teacher and healer, is dead—murdered by state authorities and turned against by institutional religion—who can live, what can live? In the meantime, instead of running away from the story we must rise from our despair. And, as Jesus did, confront the world regardless of the consequences. That is a difficult challenge for the disciples of the first century and equally difficult for the disciples of the twenty-first century. Humility in the presence of a challenge is the only way such a demand can be met. We can stand up to power with arrogant bravado or we can humbly move onward to live as Christ’s own forever as we promised to do at our baptisms. The collect for Passion Sunday, the first day of Holy Week, provides the words to give us the fortitude to face the challenge as Jesus did. The prayer states, “…in God’s tender love for the human race he sent his Son our Savior Jesus Christ to take upon him our nature, and to suffer death upon the cross, giving us the example of his great humility…” In other words, Jesus is God’s gift to us a demonstration of personal and humble sacrifice The collect for Passion Sunday continues to remind us that the followers of this humble man must exercise the same humility. Our prayer, using the collect, is, “Mercifully grant that we may walk in the way of his suffering, and also share in his resurrection…” In these words, we acknowledge we are called to live in the imitation Christ. Further, we know that, in Jesus, death is not the end. He overcomes death and is so doing overcomes the powers of evil, and we share in the promise of the resurrection. However, to be a follower of the Man from Nazareth requires strength of body, will, and spirit. Keeping before us the image of Christ Crucified, we know, despite the evil of the world, we cannot forget that Jesus turned his face to Jerusalem to meet the cruelty that lies in the human heart. A collect in liturgical observances is a prayer that sets out the purpose for the observance in the Church’s calendar. It is called a collect—pronounced col-lect with emphasis on the second syllable—meaning it is a collection of a thematic principle offered in prayer. Pages 168 and 219, The Book of Common Prayer, 1979.